Heat oven to 325°F. Grease four 4x2-inch loaf pans with shortening; lightly flour. In small bowl, mix flour, baking powder and salt; set aside. In medium bowl, beat softened butter and 2/3 cup sugar with electric mixer on low speed 30 seconds; increase speed to high, and beat 2 to 3 minutes, scraping bowl occasionally, until light and fluffy. Reduce speed to low; beat in eggs, one at a time, just until smooth. Beat in vanilla and grapefruit zest. On low speed, beat in one-third of the flour mixture, then half of the milk, beating well after each addition, just until smooth. Repeat with flour mixture and milk, ending with flour mixture. Scrape side of bowl occasionally. Beat in sour cream until blended. Divide batter among loaf pans. Bake 24 to 27 minutes or until toothpick inserted in center comes out clean. Meanwhile, in 1-quart saucepan over medium heat, cook and stir Syrup ingredients until dissolved. Immediately after cakes come out of oven, use toothpick to poke tops of cakes every 1/4 inch, and brush with one-fourth of the syrup. Cool in pans 5 minutes. Loosen sides with spatula; turn cakes upside down onto cooling rack placed over rimmed baking sheet. Poke bottoms and sides of cakes with toothpick; brush bottoms and sides with remaining syrup. Cool completely, about 45 minutes. For a pretty presentation, serve cakes upside down and topped with sweetened whipped cream, if desired. Any leftover cake can be kept, covered, in refrigerator for 1 day. 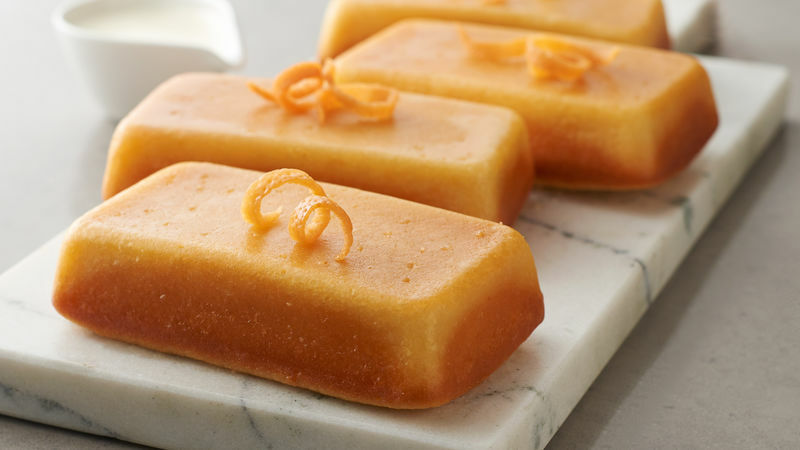 For a lovely sauce for these citrusy pound cakes, scoop some high-quality vanilla ice cream into a microwavable bowl. Microwave uncovered on High in 20-second increments until completely melted, 1 to 2 minutes. Spoon sauce onto a plate, and place your cake on top. A little grated grapefruit zest or thin strands of zest, made by using a channel knife, sprinkled over the top of the cakes makes a pretty garnish.